Christopher Creek is a census-designated place in northern Gila County in the state of Arizona. 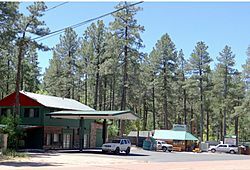 Situated at the base of the Mogollon Rim, the community lies at an elevation of 5,961 feet (1,817 m), and is located approximately 23.5 miles (37.82 km) northeast of Payson, just off SR 260. The population as of the 2010 U.S. Census was 156. Tourism, retirement and timbering are the foundations of Christopher Creek's economy. Christopher Creek, Arizona Facts for Kids. Kiddle Encyclopedia.